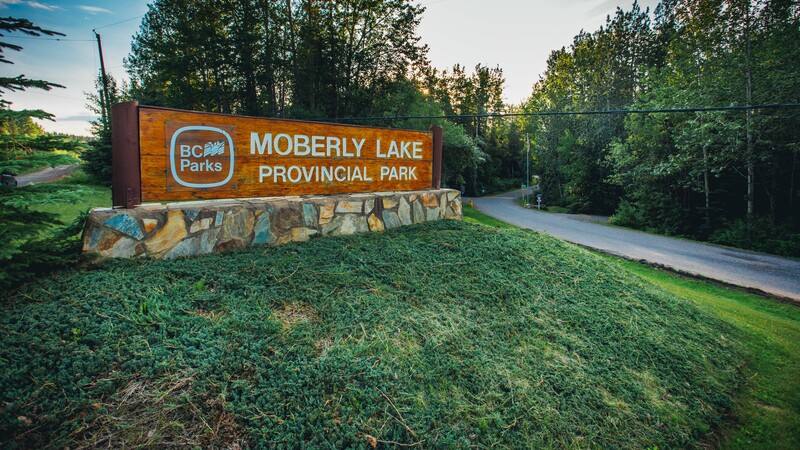 Moberly Lake Provincial Park is situated on the southern shore of Moberly Lake which is located on the boundary between the Rocky Mountain foothills to the west and the Peace plateau to the east. The park is located a short distance north of Chetwynd, BC. View the area map and be sure to take a look at the photo gallery. The lake itself lies in a broad shallow valley of the Moberly River, about 96 km from its junction with the Peace River. Enjoy a leisurely stroll along the lakeshore and pull up a bench to watch the sunset. Stop and visit the park’s interpretation kiosk to learn about the local flora, fauna and history. While you are there, take time to listen to the loons or look overhead for bald eagles. Head down to the lake for a swim or to test your luck fishing for northern pike, bull trout, lake trout and lake whitefish. Picnic Shelter: The picnic shelter in the day-use available for registration at this campground. To reserve the picnic shelter, please email info@sandstormnorth.ca with the park, date, estimated number of people, type of function, and contact person with contact information. Moberly Provincial Park is covered with a fairly dense stand of white spruce interspersed with trembling aspen and balsam poplar. Large cottonwoods occupy much of the low-lying areas. Shrubs common to the park include wild sasparilla, prickly rose, black twinberry, currant, highbush cranberry, twinflower and dwarf red blackberry. Moose and black bear are the only large animals that frequent the park. Smaller mammals like the red squirrel, snowshoe hare, muskrat and beaver are more likely to be seen. More than 25 species of birds including the common loon, bald eagle, American kestrel, spotted sandpiper, herring gull and belted kingfisher have been recorded in the park. Moberly Lake and the Peace River district are very special areas for songbirds. The black-capped chickadee, Tennessee warbler, red-eyed vireo, red-winged blackbird, Wilson’s warbler, white crowned sparrow, purple finch, dark-eyed junco, American robin, Swainson’s thrush, yellow warbler and American redstart are just some songbirds can often be seen flitting among the willow and red-oiser dogwood that grown along the shores of the lake. Moberly Lake is a productive lake for northern pike, bull trout, arctic grayling, lake whitefish, lake and mountain whitefish, longnose sucker and white sucker. Please comply with all fishing regulations to help protect some of BC’s unique species.